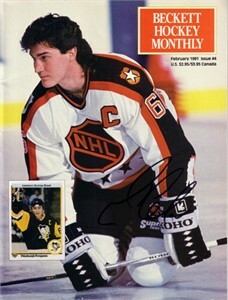 Complete 1991 Beckett Hockey magazine autographed on the cover by legendary Pittsburgh Penguins superstar Mario Lemieux, pictured at the NHL All-Star Game. With certificate of authenticity from AutographsForSale.com. Has minor creases along the spine. ONLY ONE AVAILABLE FOR SALE.